Latest post Sat, Apr 21 2018 12:05 PM by Martin Fox. 27 replies. Dear Sirs, please have a look into this matter, as the MC First is crashing upon start-up when loading the "AMPIPluginDSM.avx" file. Looks like an issue with certain avx plug-ins, You can try moving the AVX plugins one by one to check which one causes MC to crash. i would do if i could find them.... both spotlight and finder won´t reveal where the plugins are located, i have also tried to search for the extension avx, including the exact file name. I found the file after much hunting but that does not help. Only way I can get MC to start is to delete or rename the AMPIPluginDSM.avx file. Then it starts but with all audio functions disabled which is not too helpful. When i clear the directory completely, it just silently quits on "Initializing plugin: AMPIPluginDSM.avx", not even showing the crash reporter. This should also not happen, right? I had that problem in MC:F 2018.3, and it also happens in MC (no ":F") 2018.4. I am getting this crash on fresh installs with just the stock AMA directory in my "AVX2_Plug-Ins". I'm basically having the same problem ( http://community.avid.com/forums/t/184197.aspx ). I tried to duplicate your test results, but the best I could achieve was a "silent crash." I hope someone can figure this out. I was really hoping to enjoy MC! Now I'm confused. Non of the files you mention exist in my AMA directory! This is a MC First 2018.4 install downloaded yesterday. The most common workaround for this error whther it be MC First or MC is to move ALL the audio plug-ins out of their folder. Create a new folder on the desktop. Open the AVX2_Plug-Ins folder and drag all the contents to the new folder on the desktop. A MC Forums search will probably show posts that have identified some of the plug-ins others have had trouble with over the years. just tried that. It started with the error that quicktime is not installed then crashed with the same error initialising AMPIPluginDSM.avx. 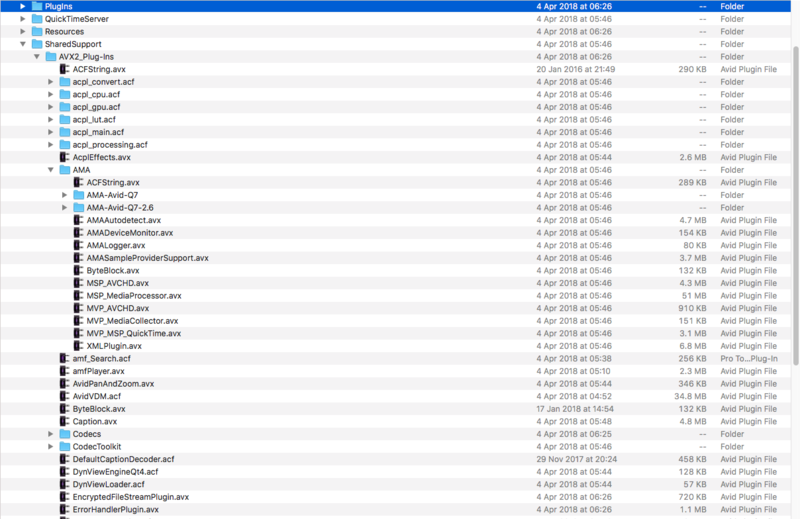 Still confused as to why the contents of my AMA folder are so different to someone elses with exactly the same install. Did you have MC full or PT first or PT full installed? Yep, exactly the same here. There are TWO locations for AVX2_Plug-Ins: One within the MC application bundle in Contents/SharedSupport/AVX2_Plug-Ins, and one in /Library/Application Support/Avid/AVX2_Plug-Ins. I was talking about, and testing with, the latter. back to you all tomrorow. I removed all 5 from the other location in library/ and still the same crash of Ampiplugindsm.avx so not quite the same results as you but certainly no better. But I did get the crash reporter.